It’s been a funny old week, starting last Friday with Children in Need, all about raising money for good causes, and ending with Black Friday, all about spending money in hyped-up sales. As someone who believes that the most important things in life aren’t things at all (a great phrase from Sue’s website over at Our New Life in the Country), I find all the emails urging me to “buy, buy, buy” rather unsettling. Yet with Christmas coming, and a month-long madness of family birthdays on top, even I’ve had to start finding some presents. Here’s my round up of our five frugal things this week. I pretended the children made them. They hadn’t. Last Friday the children’s school was fundraising for Children in Need. I’d promised to bake for the cake sale, but then got bogged down in work. 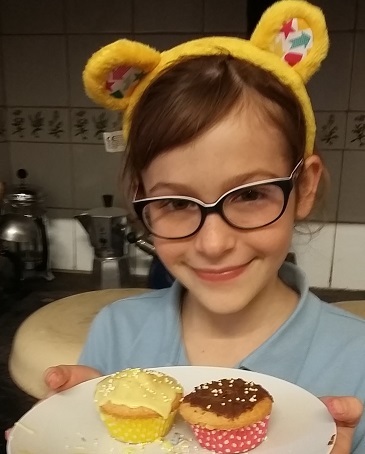 Rather than the carefully-produced Pudsey-themed cakes I’d imagined, I ended up with less than an hour before school pick up. Aaaargh! I figured I could throw together some cupcakes in time, right until I checked the fridge – almost out of Stork. Fridge – no spare butter. Butter dish – almost out. Triple aaaargh! Luckily when I ran round to our next-door-but-one neighbour Helen, a stalwart of the WI and ex-Brownie leader, she kindly gave me a box of Stork. 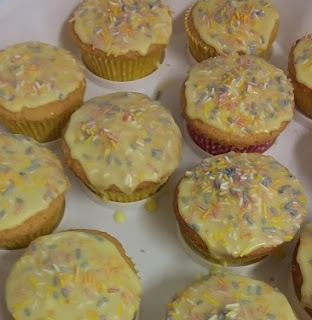 Anyway, the photo above shows the rushed results of my approach to baking for school cake sales – basically stick enough sprinkles on top of value range ingredients, and they’ll sell. I made 24 cakes, and reckon they came out at 10p each, which is just as well as I think the school only sell them for 30p a pop. A combination of value range ingredients, cake cases at £1 for 100, and sprinkles from the Jane Asher range at Poundland (2 pots for £1) keeps the cost down. So – hardly things of beauty, but all in a good cause. Free £10 to spend? Don’t mind if I do. Sometimes not doing much shopping comes in handy. Last week, a £10 White Company voucher showed up in the post, to “tempt me back” because I hadn’t bought anything in ages. It was my favourite kind of no-strings-attached voucher, with no minimum spend, and I’d also put aside a 20% discount card from a catalogue. 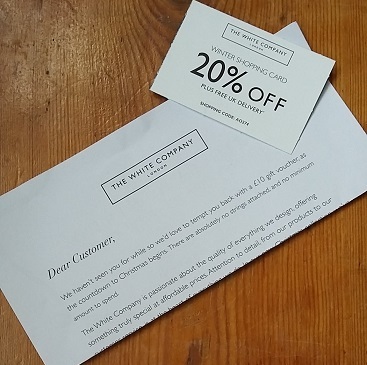 I nipped into a shop while I was in Cambridge on Saturday, so I could avoid wasting part of the voucher on postage. It turned out a lot of the stuff was already reduced by 20% or 30%, so although I couldn’t use the discount card on top, I could still use the voucher. I ended up buying a fancy Christmas present for 75% less than the official price – many cheers! Spending Nectar points at Sainsbury’s can be a tad more complicated than the White Company’s “have a free tenner” approach. 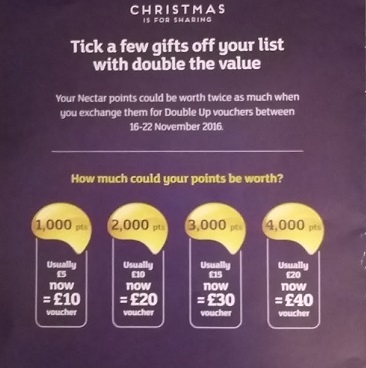 During Double Up promotions a couple of times a year, Nectar points are worth twice as much as normal. It sounds great, but can make your head hurt when you realise it only applies to specific categories. 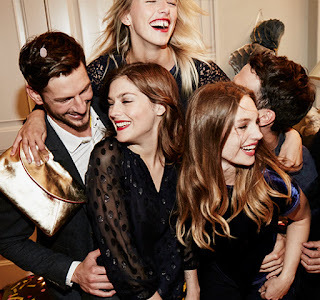 Forget food – it’s limited to spending on toys, entertainment, electrical, Tu clothes, homeware, seasonal stuff and selected Sainsbury’s Taste the Difference booze. The vouchers have to be requested and spent on the individual categories, rather than across the whole lot, and jump up in £10 chunks without giving change. Anyway, I tend to hoard Nectar points, waiting for Double Up promotions. We don’t do much food shopping at Sainsbury’s any more, so I don’t get many Nectar points that way. However, my husband still stops at a Sainsbury’s petrol station on the way home, so we earn points on fuel. I spotted the promotion was running earlier this week, and shot over to Sainsbury’s to swap £30 of Nectar points for £60 of shopping. I emerged with sparkly shoes and a skirt for my daughter, plus Christmas presents including three DVDs, a big Lego set and a couple of Lego mini figs for stockings. I reckon this is a great example of money for nothing apart from a headache working it all out. We’d buy fuel there anyway, and just by handing over a loyalty card, we’ve ended up with £60 worth of shopping. Obviously by getting 30% off a Boden shirt for my husband, our Christmas will suddenly look like this. Yup, yet more Christmas and birthday shopping. After avoiding spending for so much of the year, it feels really weird to be buying lots of things now. Reflecting on the presents I’ve bought this week, I seem to have followed the “something you want, something you need, something to wear and something to read” approach, whether conciously or not. The frugal part when buying the assorted toys, chocolate, clothes and books online has been clicking through from cashback websites beforehand. This week I’ve racked up more than £18 cashback with TopCashback, on stuff on offers and in sales that I was intending to buy anyway. If you’ve never signed up with cashback websites like TopCashback or Quidco before, then hang on for a decent “new customer” joining bonus. In October, I finally took the plunge with Quidco when I was promised £15 for joining, which is now safely in my savings account. TopCashback is running a similar kind of promotion now, so if you sign up using this link*, and spend £10 or more at any one of the sites listed on TopCashback before 4 December, you will receive £15 in cashback. (More info on cashback websites in this post and this one). I was intrigued to see a photo on Instagram recently, where someone was planting oodles of garlic cloves to prepare for a crop next year. 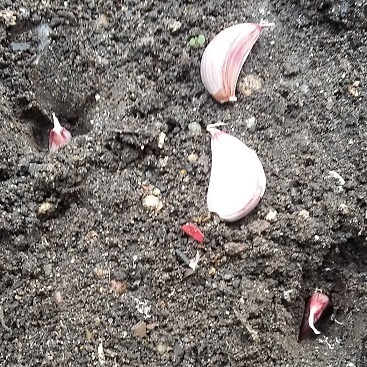 As I had a couple of bulbs in the cupboard, I figured it was worth a punt sticking some cloves in the herb bed. (More about the herb bed here). Who knows whether anything will emerge, but I shoved some in the soil, and marked the position with short bamboo canes to avoid weeding them by mistake. Fingers crossed for next spring! This week I had to fill in a form about the blog which wouldn’t let me submit it without a Facebook page link. So now I have a Facebook page for Much More With Less, even if I’m not entirely sure what to do with it. I’ve also added it to the “follow me elsewhere” buttons at the top right of the blog. Anyone else have frugal successes to share? Or are you staying away from your keyboard in the face of Black Friday? I’d love to hear! We grow garlic – it's great! We easily grow enough to keep us self-sufficient in it! We need to get ours in the ground now too – thanks for the reminder! Nectar points baffle me too. We save ours up for the Christmas booze/food shop. Didn't know about the joining offers on cashback sites, I normally use Quidco but going to check out Topcashback now too, thanks for the tip!